Some prospective home buyers have a deck on their list of mandatories. 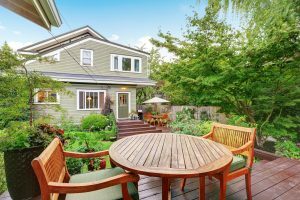 Having a deck opens up the market for you, giving you a wider range of potential buyers. This raises your chances of finding a buyer to match or exceed your desired selling price. Decks can be used for various purposes to suit everyone’s needs. Decks are an outdoor entertainment classic. Combined with an outdoor furniture set, timber decking is the perfect setting for a backyard BBQ. Decks are also used as the centre of a backyard garden. From fruit, vegetables, and herbs, to flowers and ferns, quality decking is an asset all green thumbs will appreciate. A third common deck use is as an extension of the home, providing a relaxing area, combining the comfort of inside and the freedom of the outdoors. A professional deck is one of the quickest and most cost effective ways to boost your properties value. Decks are highly sought after in Australia, but because of this, buyers also have higher standards than in other countries. The fine attention to detail that comes with a professional deck goes a long way to impress buyers. For the past 15 years, MTB Carpentry and Construction have been using the highest quality timber and finishers to build the finest decks. For a value boosting professional deck built with the highest standard of workmanship, call MTB Carpentry and Construction Burleigh on 0410 491 080 or visit our website.